As the weather becomes hotter, I like to go lighter when it comes to cosmetics instead of clogging up my pores with heavier formulations. 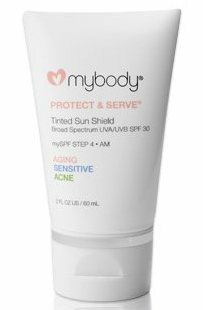 One of the best ways to simplify your upcoming summer beauty routine is through a dual purpose tinted moisturizer with built in sun protection like MyBody’s Protect & Serve Tinted Sun Shield with an SPF of 30. MyBody is an exciting line of medical-grade skin care that can address a variety of skin problems that I have been testing lately. Protect & Serve comes in one shade, which I had worried about since I have light skin until I had used it and found a nice glow. What I have been discovering is this product provides enough sheer tinted coverage that hides imperfections with just enough color to smooth out your skin tone while keeping your face clean and guarded from the sun. You can use this oil-free product alone or as a makeup primer if heavier coverage is what you’re after. Seriously though, I think you’ll be satisfied enough with using this tinted moisturizer alone unless you suffer from a severe skin problem. In a formula with vitamin D3, lycopenes, titanium oxide and zinc oxide among other beneficial ingredients, this silicone-based moisturizer glides on while keeping skin nourished and vigorously protected from UVA and UVB as it beautifies the complexion at the same! Personally, I am impressed with Protect & Serve Tinted Sun Shield and this company. This is the third product that I tried from MyBody and I definitely will be looking into more of their line! If you also value the look of your skin, then I highly recommend checking out this product. They even have a helpful online tool to help you determine the best skin care solutions for you.